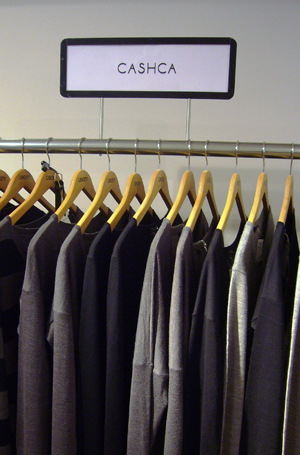 Virtually all of knitwear retailers sell through websites. This can work for a knitwear collection that is essentially simple classic shapes but this is not what CASH CA is about. For our product, customers need to feel and wear the garment to fully appreciate the cut, superior handle and detail that goes into every style, whether that be cashmere sweater or cashmere/ merino combination slippers.Thus we have built our business through key retailer partnerships and are very proud of the relationships we have established with some of the best independent retailers and top end department stores in the country. Key to our future plans is this website. Here and through the integration of social media such as Twitter and Facebook, we plan to build close working relationships with our retail partners, keeping you up to date on new developments, special promotions we are planning, in season stock injections, press updates and any other useful information. Stay connected and up-to-date with CASH CA through our new Facebook page and Twitter account or sign up to our monthly newsletter for regular updates and announcements. If you would prefer to contact us directly please use the appropriate email address on our contact page.